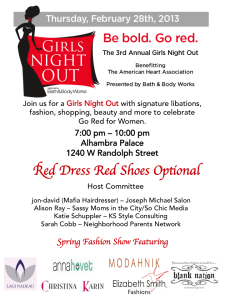 Join us at the 3rd Annual Girls Night Out Go Red For Women Event in Chicago on 2/28/13 | A Savings WOW! B96, 104.3 K-HITS and Bath & Body Works join together to celebrate the American Heart Association’s Go Red for Women movement on Thursday, February 28, from 7:00 pm to 10:00 pm at Alhambra Palace Restaurant, located at 1240 West Randolph Street in Chicago. The 3rd annual “Girls Night Out –Go Red for Women” event, hosted by some of Chicago’s most fabulous personalities, features a red carpet, fashion show, cocktails, hors d’oeuvres, shopping, beauty services, raffle prizes, a swag bag and more! Event hosts include Alison Ray of Sassy Moms in the City/So Chic Media, Mafia Hairdresser from the Joseph Michael Salon, Katie Schuppler of KS Style Consulting and Sarah Cobb of Neighborhood Parents Network. Guests are encouraged to wear RED and will be treated to signature libations and an evening of entertainment. B96 will be spinning tunes well into the evening, topping off the night with a high style fashion show previewing collections from Chicago Fashion Incubator’s top designers including Anna Hovet, Christina Karin, Lagi Nadeau, Elizabeth Smith Fashions, Modahnik and Blank Nation Apparel. Hosted by stars of CBS Radio – Showbiz Shelly from B96 and Dave Fogel from K-HITS. Tickets are $35 and available online through Eventbrite. * SPECIAL OFFER * Use the discount code GoRed2013 to take $5 off the price of a VIP ticket. A portion of event proceeds benefit the American Heart Association Go Red for Women initiatives. So, will you join us at the 3rd Annual Girls Night Out Go Red For Women?